Vitalise is a vibrant nutritional blend containing 30 organic ingredients including concentrated extracts from 10 herbs and spices, 7 fruits, 3 seaweeds, 2 vegetables, 2 mushrooms, 2 freshwater plants, 1 grass juice and magical flower pollen. Made with some of nature`s finest herbs and grown in fertile organic soils, it captures the incredible essence of nature`s bounty. Vitalise combined with a balanced and varied diet helps you to maintain energy levels and deal with the stresses of modern life, whilst helping you live life to the full. This broad-spectrum formula contains the highest organic grade, sustainably cultivated fruits and herbs carefully selected to bring you the full potential of nature`s goodness. Beetroot juice crystals* 13%, Alma fruit powder, Slippery Elm bark, Wheat Grass juice powder 30:1, Carrot juice crystals*, Acerola fruit concentrate, Flower pollen, Spirulina, Licorice root, Peppermint leaf, Bilberry fruit fresh freeze dried 8:1 4%, Chlorella cracked-cell, Alma fruit juice freeze dried crystals 20:1, Pomegranate fruit juice freeze dried crystals*, Seagreens Arctic fresh seaweed blend, Cordyceps full-spectrum, Reishi full-spectrum, Cranberry fruit fresh freeze dried 10:1*, Turmeric root wholistic extract*, Holy Basil leaf wholistic extract*, Ginger root wholistic extract*, Cinnamon bark wholistic extract*, Red Ginseng root 1%, Vitamin B Complex Orgen-Bs (Holy Basil, Lemon and Guava fruit extracts), Aloe Vera juice concentrate 200:1, Green tea leaf aqueous extract. *Contains non organic anti-caking agent-silicon dioxide. Mix 1 teaspoon (4g) with water. 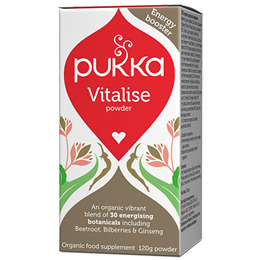 Below are reviews of Pukka Organic Vitalise Powder - 120g - Best before date is 31st May 2019 by bodykind customers. If you have tried this product we'd love to hear what you think so please leave a review. 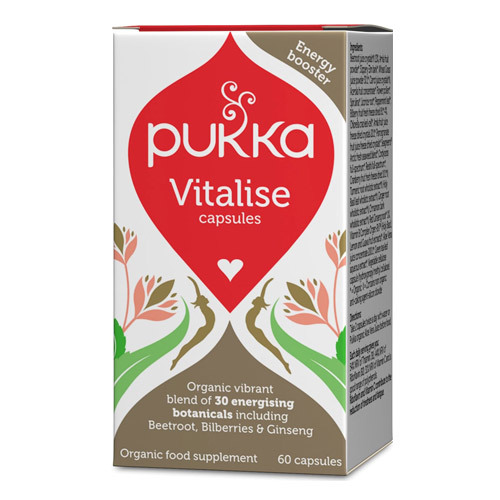 Vitalise is a vibrant nutritional blend containing 30 organic ingredients. Made with some of nature`s finest herbs and grown in fertile organic soils, it captures the incredible essence of nature`s bounty.